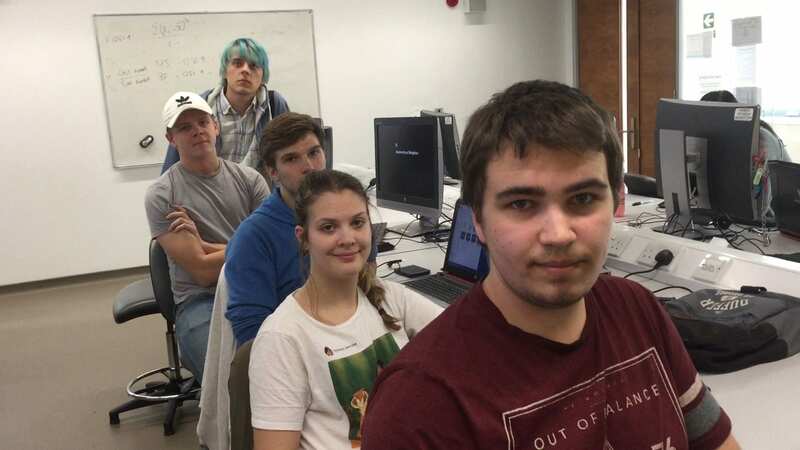 As part of the Integrated Group Project module, our computing students were asked to develop an educational game. 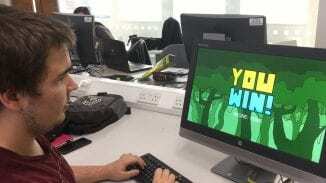 The top three games were submitted to the 6th International Educational Games Competition at the 12th European Conference on Games Based Learning (ECGBL 2018) that will take place on 4 – 5 October 2018 at the SKEMA Business School, Sophia Antipolis, France. All three submissions were shortlisted (out of 60 submissions in total) in the ‘games in development’ category. 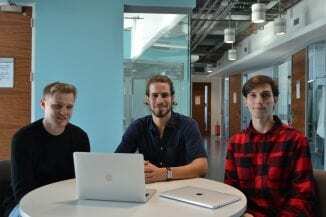 Three of our second year Computer Science BSc(Hons) students, Tom Corlett (Computer Science BSc), Michael Cruz Cervera and Angel Kozlev will be travelling to France for the final round of the competition where they will present their games to the judges. 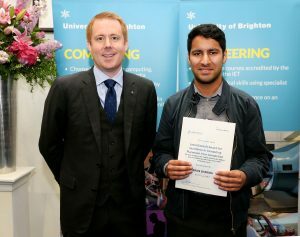 Arun Sharma is currently on placement as a junior software engineer at West Control Solutions, and is one of two recipients of the Lancia Consult Award for Excellence in a Computing Placement Year at our school awards ceremony. 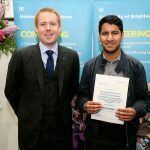 We caught up with Arun, a student on our Computer Science (Games) course, to find out more about his placement and life at Brighton. 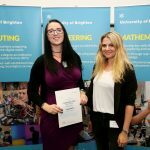 “I’ve always wanted to explore a degree with an emphasis on games, and Brighton offered me the chance to do so, with the opportunity to transfer from a partner college to the second year of the Computer Science (Games) course here. 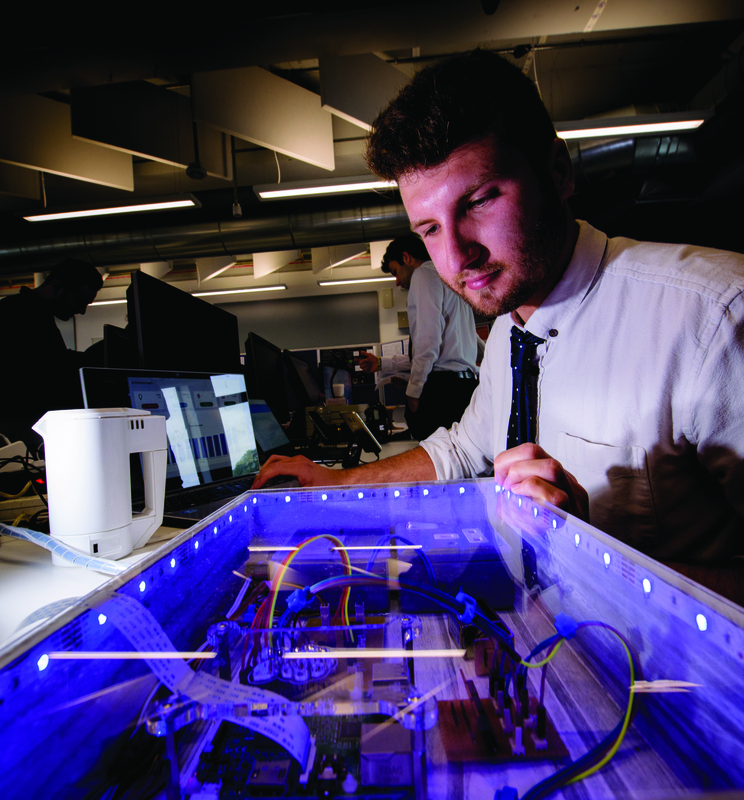 Highlights of the course for me include the variety of lecturers and their well-established backgrounds, and the 3D Graphics and Animation and the Intelligent Systems modules. 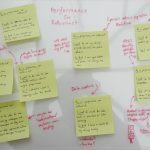 Intelligent Systems not only provided a glimpse into game development but also other real-world applications. I must also recommend the placement year; regardless of any computing course you apply for. It expands your knowledge, allows you to make new contacts as well as possibly having a job offer at the end of it! The placement office was absolutely excellent, consistently reviewing and offering improvements to my CV and offering mock interviews and tips. I am currently on placement at West Control Solutions as a junior software engineer. The Computer Systems Architecture module has been invaluable for my placement, giving me a solid understanding hardware basics for computer systems. I have already formulated a final year project using the technologies and programming languages I have acquired on placement. Congratulations to Arun on his achievements so far! We celebrated some fantastic successes today with our award-winning computing students. Head of School, John Taylor, introduced the School of Computing Engineering and Mathematics awards ceremony by leading a round of applause and congratulating all our winners. 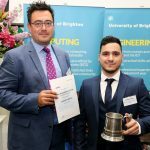 Congratulations to Beck Rush, Digital Media Development BSc(Hons) and Arun Sharma Computer Science (Games) BSc(Hons)who both received the Lancia Consult Award for Excellence in Computing Placement Year and £500 each. 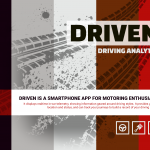 The prize is awarded by a University of Brighton alumnus, the MD of Lancia. Becky spent her placement year at the BBC, you can read about some of her experiences on this blog, including this post. And Arun worked for West Control Solutions, a local software company. We will be finding out more from Arun about how his placement went, soon. 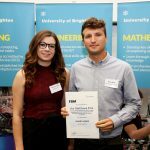 Rupert Agnew Computer Science BSc(Hons) received the FDM Group Prize, and £250, for the best development project from a final year student completing either the Computer Science BSc(Hons), Computer Science (Games) BSc(Hons) or Software Engineering BSc(Hons). You can find out more about Rupert’s project on the blog, here. 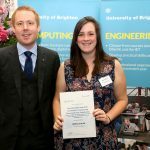 Digital Games Production student, Laura Marquick was the recipient of an award from one of our accrediting bodies, the BCS, the Chartered Institute of IT Project Prize for the best project by a final year undergraduate computing student. Laura’s project explored ways to use the structure, abstraction, and discipline of programming to interpret physiological data from the human body and product unique visual effects that reflect the natural beauty of the body’s biological processes. 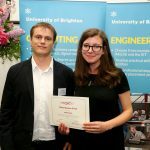 Our computing division has strong links with Wired Sussex, and Digital Media student, Jaime Dare, and Digital Games Production student, Scott Jarvis were the recipients of awards from Wired Sussex for the best project for a Digital Media, Digital Media Development and Digital Games Production by a final year student. The celebrations for our graduating students continued into the afternoon with our school graduation ceremony at the Brighton Centre. 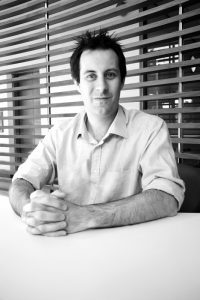 Rupert Agnew, studying Computer Science BSc(Hons), has designed ‘Home Automation using Raspberry Pi’, which, among a multitude of uses, will feed your cat when you are away from home. 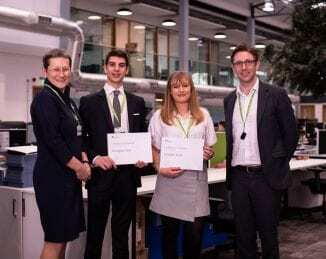 This final year project has won Rupert a prize from the international IT services company FDM Group. The system uses the Internet of Things to link hardware and software devices in people’s homes. He said: “Nowadays almost everybody has a smart phone and almost everybody has a WiFi connection in their home – but how many can control home devices securely from their phone? My project takes advantage of the low cost Pi but shields people from the complexity of programming and piecing it together. “All peripherals connected to the Pi can be remotely controlled from a mobile, tablet or desktop computer from anywhere in the world. After logging onto the website using their credentials, the user is presented with a dashboard which allows them to interact with their home appliances – door locks, view a webcam stream, control lights, control AC mains plug.